Did anyone else's week fly by as fast as mine? Friday, I am sooooo happy to see ya! What does eveyone have on tap for the weekend? Other than the regular swim class on Saturday morning, I'm not too sure yet. I do know that we wanted to make it to Oktoberfest, so I hope to get there at some point. I'm also really excited for an afternoon Packer game on Sunday. I can never make it up for the night ones. Yes, I know I'm lame. You know what's not lame: all these these things I'm loving this week. How'd you like that segue? Pretty good, if I do say so myself. 1. Can we talk about how excited I am for October? Since it's now official, I'm busting out all of the Halloween decorations this weekend! The first day of October here in Milwaukee was just gorgeous, too: blue skies, a little chill in the air. Keep doin' you, October. I like it. 2. On Tuesday, we finally got to the Milwaukee County Zoo to see the newborn giraffe. At two weeks old, it already stood almost six feet tall! It was so adorable. Even though it was huge, it still seemed like a baby. If you haven't had a chance to go see the giraffe yet, go check him out. It was all Callum could talk about after our visit. He kept saying "baby giraffe, baby giraffe" over and over. 3. I made my first batch of soup this week, and it was everything. Seriously. Soups are probably one of the easiest dinners to make, plus it is such a great way to sneak some extra veggies in for Callum. I made this Crock Pot (High five for the Crock Pot!) Cauliflower Sweet Potato soup. I think I'm going to post a round-up of kid-friendly soup recipes some time in the next few weeks. What are your favorite soup recipes to make for your kids? Bonus points if you can make them in the Crock Pot! 4. 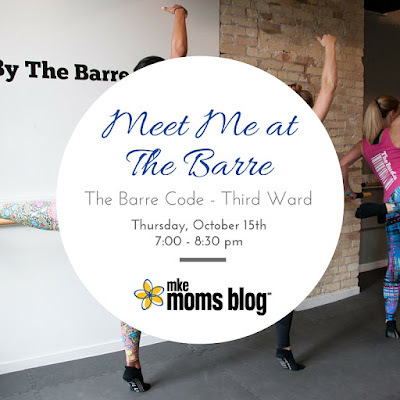 MKE Moms Blog announced it's first event for Milwaukee area Moms: Meet me at the Barre on October 15. I'm so looking forward to this! Hope to see you there! 5. Finally, I just have to give a big shout out to our Milwaukee Art Museum. Callum and I went on Thursday for their free day, and were initially disappointed to find the main exhibition area closed for remodeling. We started walking through the atrium, and came across a bunch of art packs that kids can check out for free while they visit the museum. We took this one that included a ton of blocks for kids to build their own Calatrava. There we sat on the floor of the museum, playing with blocks and watching Lake Michigan. It was so perfect! The next time you are at the MAM, be sure to check theses art packs out. They had a bunch for kids of all ages.